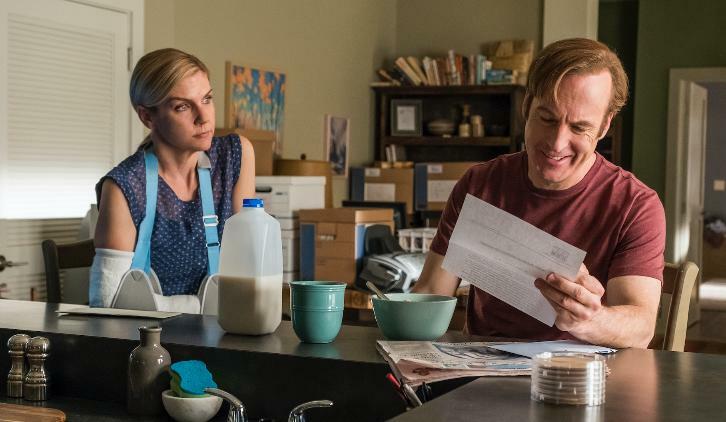 The Better Call Saul team revealed that Tony Dalton will play Lalo, a character never seen but referenced in the season two episode of Breaking Bad that introduced the world to Saul Goodman (Bob Odenkirk). As Saul knelt over a grave dug by Walt (Bryan Cranston) and Jesse (Aaron Paul), he screamed that it was Nacho (Michael Mando), not him — and asks Walt and Jesse if Lalo sent them. It's a seemingly throwaway line fans have long speculated would show up in Saul. "You are going to meet people who are referenced in Breaking Bad but you've never met," said Odenkirk, after which co-creator Peter Gould screened that Lalo scene from Breaking Bad to the Hall H crowd as a way to remind people. Then they showed off the first photo of Dalton in character, bending down to speak to a wheelchair bound Hector Salamanca (Mark Margolis). I thought some of you might be interested in if you haven't already seen, the 10th-anniversary reunion photos of the cast of Breaking Bad. Thought it might be fitting since this is the prequel to that popular series per Entertainment Weekly. If you aren't interested in them, sorry. 15 More Photos via Entertainment Weekly. 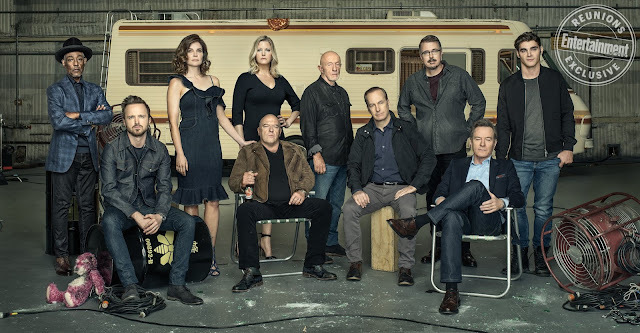 NEW YORK, NY – May 31, 2018 – AMC announced today an August 6 premiere date for its original series “Better Call Saul” and “Lodge 49.” Season four of the critically acclaimed and Emmy®-nominated “Better Call Saul,” produced by Sony Pictures Television, will air Monday, August 6 at 9:00 p.m. ET/PT immediately followed by the series premiere of “Lodge 49” at 10:00 PM ET/PT. 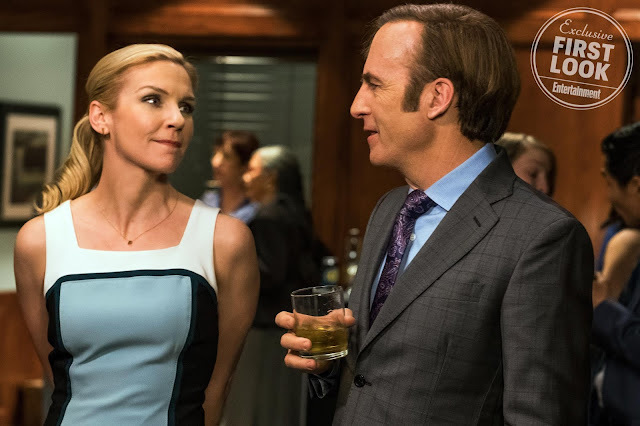 Both series will have a presence at the ATX Television Festival, taking place June 7-10 in Austin, Texas, including a panel with “Better Call Saul” executive producer Vince Gilligan and star Bob Odenkirk, and a sneak peek screening of the “Lodge 49” premiere followed by a panel with stars Wyatt Russell and Brent Jennings and executive producers Peter Ocko and Dan Carey. “Lodge 49” is a light-hearted, endearing modern fable set in Long Beach, California about a disarmingly optimistic local ex-surfer, Dud (Russell), who’s drifting after the death of his father and collapse of the family business. Dud serendipitously finds himself on the doorstep of a rundown fraternal lodge, where a middle-aged plumbing salesman and “Luminous Knight” of the order, Ernie (Jennings), welcomes him into a world of cheap beer, easy camaraderie and the promise of Alchemical mysteries that may — or may not — put Dud on the path to recover the idyllic life he’s lost. Jim Gavin (Author, Middle Men) serves as creator, writer, and executive-producer alongside showrunner Peter Ocko (Pushing Daisies, The Office). Additional executive producers include Paul Giamatti (“Billions,” Sideways, Outsiders, Hoke), Dan Carey (Outsiders, Hoke, John Dies at the End, All Is Bright) and Jeff Freilich (“Halt and Catch Fire,” “Grace and Frankie”).